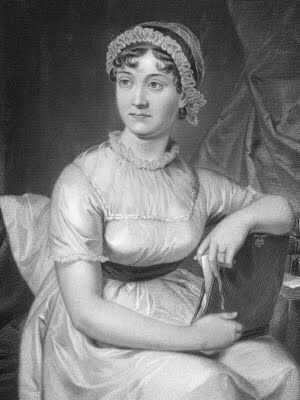 Jane Austen (16 December 1775  18 July 1817) was an English author who lived in the late 18th/early 19th century and wrote six novels between 1790 and 1817 before dying at the age of 41. Her books were published anonymously during her lifetime, but she is now one of the most famous authors in the English language. Her novels are written with wit and frequent irony, and all follow a similar formula: gentlewoman sooner or later falls in love with man but can't marry him because he's engaged to someone else/he's in love with someone else/etc. Often there are cads to tempt her as well, but ultimately she ends up with the good guy who won't steal all her money or abandon her somewhere. There's far more variety among her heroines in terms of personality, though. She specialized in two types: Spirited Young Lady, the lively, witty, restless heroine who never fears to speak her mind (Elizabeth Bennet, Marianne Dashwood, Emma Woodhouse); and the quiet, Stoic Woobie who rarely if ever speaks her mind since everyone misjudges her anyway (Elinor Dashwood, Fanny Price, Anne Elliot). 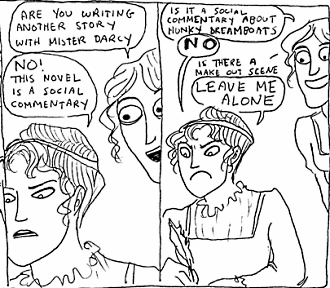 Despite being nominally romance novels, and writing in a period that overlapped with Romanticism, Austen's works are not classified as Romantic-with-a-capital-R. Austen strikes a balance between Romanticism and Enlightenment - her happy endings are born of social harmony as well as warmth of feeling. Austen is well-known for her wit, satire, and proto-feminism; serious critics consider her to be the equal of Cervantes, Milton, and Shakespeare. Virginia Woolf called her the first truly great female author, and the first good English author to have a distinctly feminine writing style. Rex Stout considered her the greatest English writer ever—yes, even above Shakespeare. Heady praise from a man who claimed to have previously believed that men did everything better than women. She ended at #70 in 100 Greatest Britons. Love and Freindship (novella) - a posthumously published parody of contemporary romance novels. She appeared several times on Hark! A Vagrant. See this comic ◊. TV movie Miss Austen Regrets portrays her later years. Adaptation of her novel Mansfield Park incorporated some of Jane Austen's character traits, writing and life events into the character of Fanny. She appears in Saints Row IV, of all games, as the narrator. Both the Boss and Zinyak are also stated to be fans of hers. In 2017 she appeared on the UK £10 banknote, replacing Charles Darwin. She pops up in Edgar Allan Poe's Murder Mystery Dinner Party. Oh, and she also apparently wrote the "novel" Mafia! which was finally made into a movie in 1998.note Mafia! is a spoof of gangster films, but mostly of The Godfather directed by Jim Abrahams of ZAZ fame who also directed Airplane! and Hot Shots!. This is referring to the movie being jokingly marketed as Jane Austen's Mafia!. Accomplice by Inaction: In the unfinished The Watsons, the eldest brother Robert lets his sisters live in relative poverty, except the one he invites home. "With a perversity of judgement, which must be attributed to his not having by Nature a very strong head, the Graces, the Spirit, the Sagacity, and the Perseverance, of the Villain of the Story outweighed all his absurdities and all his Atrocities with Sir Edward. With him, such Conduct was Genius, Fire and Feeling. It interested and inflamed him; and he was always more anxious for its Success and mourned over its Discomfitures with more Tenderness than could ever have been contemplated by the Authors." Fan Community Nicknames: Some of her fans call themselves "Janeites". Good-Looking Privates: In The Watsons (fragment of a novel), Mary Edwards is courted by Captain Hunter. After a ball, her mother is not very satisfied that Mary had been dancing with military men only, and neglected their neighbours because of them. Particularly a certain son of a certain rich banker. "Mary was surrounded by red-coats all the evening. I should have been better pleased to see her dancing with some of our old neighbours, I confess." Charlotte Heywood in Sanditon comes from a family of 14 children. The Watsons from The Watsons are a large family: sisters Elizabeth, Penelope, Margaret and youngest Emma and brothers Richard and Sam. Passed-Over Inheritance: Emma Watson is brought up by her wealthy aunt and she's openly acknowledged as her child and heiress. However, Emma's aunt is widowed and later re-marries, and then Emma has to return home to her much poorer family. Regency England: Regency England is the setting of her novel. It's always somewhat idealised version of it, focusing on pastoral idyll of the countryside, visits, balls and dances, dinner parties, garden parties and picnics. Her focus is the upper-middle class. Sitcom Arch-Nemesis: In Sanditon, Mr. Parker treats the rival seaside town of Brinshore as one — he always finds faults with Brinshore and considers Sanditon vastly superior. It's very entertaining, considering how Sanditon and Brihshore are practically identical.